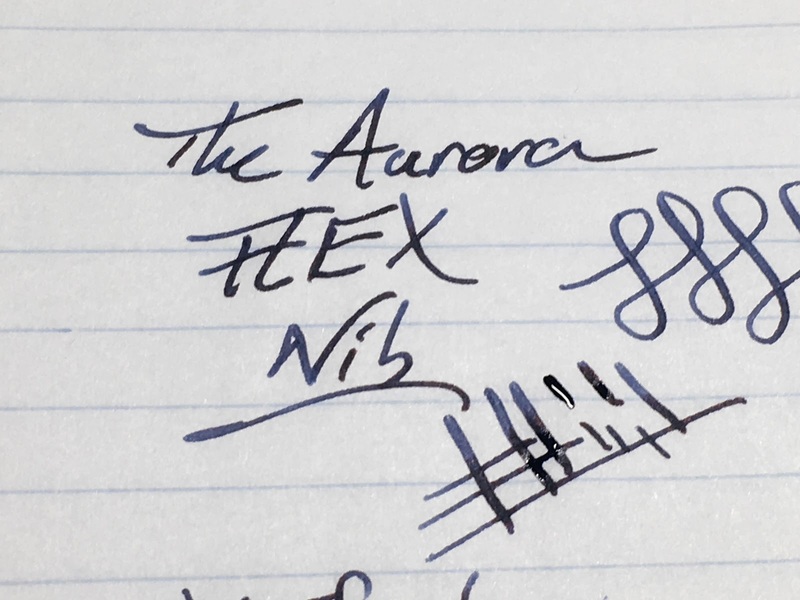 The New Aurora Flex Nib | Inkdependence! This nib is coming out soon, and I'm glad that I got a chance to check it out for a few days. Thanks for this review (and the YouTube video to go with it) go to Cary and Kenro. I had to send this back to them all too soon. 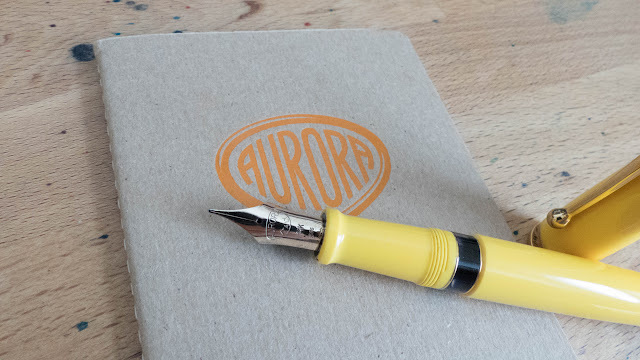 The pen that this nib is fitted to is the same sort of Aurora that I reviewed a couple of weeks back: the Aurora 88. This one is an upcoming limited edition of Anniversary pens. There will only be 188 of these in each of 8 (at least, I'm pretty sure there will be 8) colors. You can find the blue and red ones right now, but they're only available for pre-order at this time. They should be out soon, but I've heard that the demand for these $650 pens is pretty high so you should get in contact with your favorite retailer. The nibs at Aurora are all made in-house at their Italian facility, and this one is no exception. According to Cary at Kenro, this one required some special new equipment to fashion. It's a 14k gold nib, and it's shaped differently than the regular 88 nibs. You'll see that below, but it would be a good idea to check out the video for this pen so that you can see it in action. Here's some more of this awesome yellow pen. I hear that there's going to be an orange one, as well, and that's rad. As you can tell, the flex nib has longer, skinnier tines than the standard fine nib and a lower shoulder. 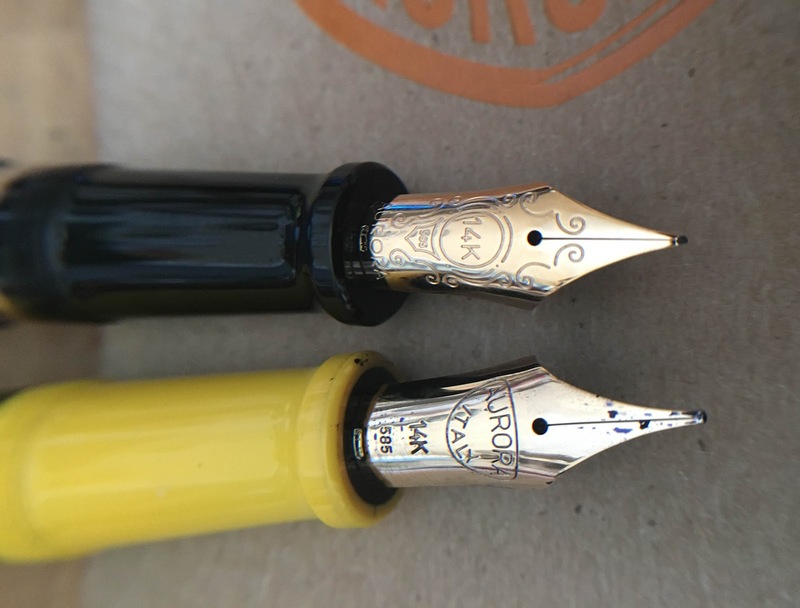 That difference is part of what makes this nib flex while the standard nib is a solid nail. They're very different writing experiences. Here's a view from the bottom. Both of these feeds are marked "F", but their line weights aren't really the same. The flex nib writes about a size larger than the regular fine nib, I think. 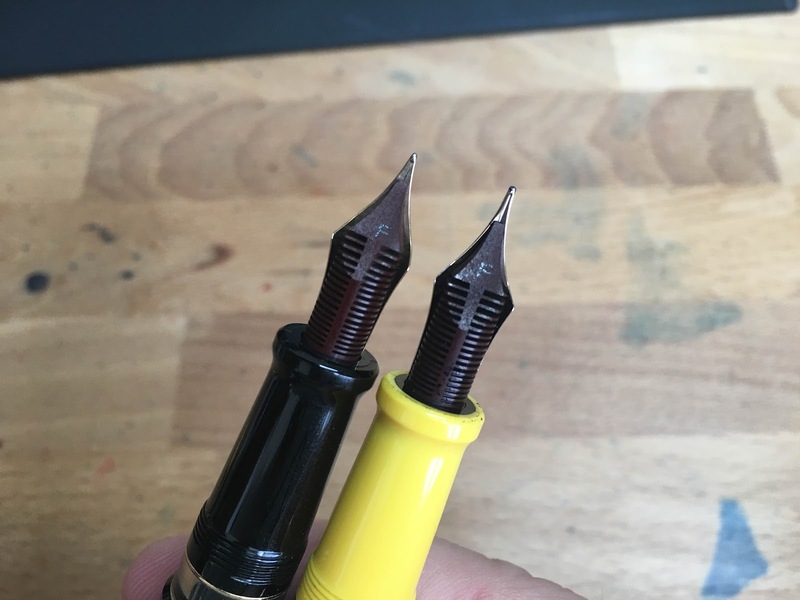 You can also see how much longer the tines are on the flex nib. These writing samples were done with the new Aurora Blue Black ink. 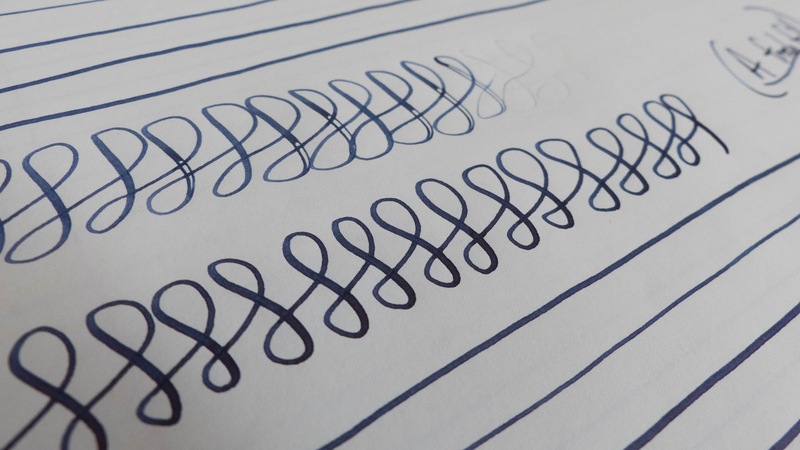 The flow of the flex nib really allows the Blue Black to show its great shading. I didn't have much trouble from this pen with this ink in my every day writing. I took many pages of notes with this pen, and I can say that it's a very usable every day driver. There's some flexing while you write, but it's not irritating and there's none of this stuff where the inside of the nib is scratchy and it catches on the paper. The tines didn't have any problem returning to the right place after flexing, either. There were zero misalignments in my time testing this pen, and I'm a total noob when it comes to flex nibs. None of this is to say that it was problem-free. There were some railroads in that top line below, and I attributed it to the pen running out of ink. It was. The 88 can hold a good amount of ink, but the wet nib goes through a decent amount of it. I re-inked, and the bottom set of squiggles were much better. I did have an issue with railroading when I was flexing while making the video review, and it appeared that the surface tension of the ink between the tines was too weak under flex. When you flex a nib, you're basically doing something like when you blow bubbles with a bubble wand. You can't let the surface tension pop or it's game over. That made me think that maybe the ink just wasn't ideal for this use. As a result, I decided to flush it out and re-ink with Aurora Black. That's one of the best inks when you need a wet ink, and it performed super well. Once I started using Black instead of the drier Blue Black, the pen was pretty awesome. Remember, folks, it's not just the pen. It's the pen, the ink, the person, and the paper that determine the way a pen performs. If a pen isn't working the way you'd like, you might just be able to alter one or two of those variables instead of sending the pen off for expensive alterations. 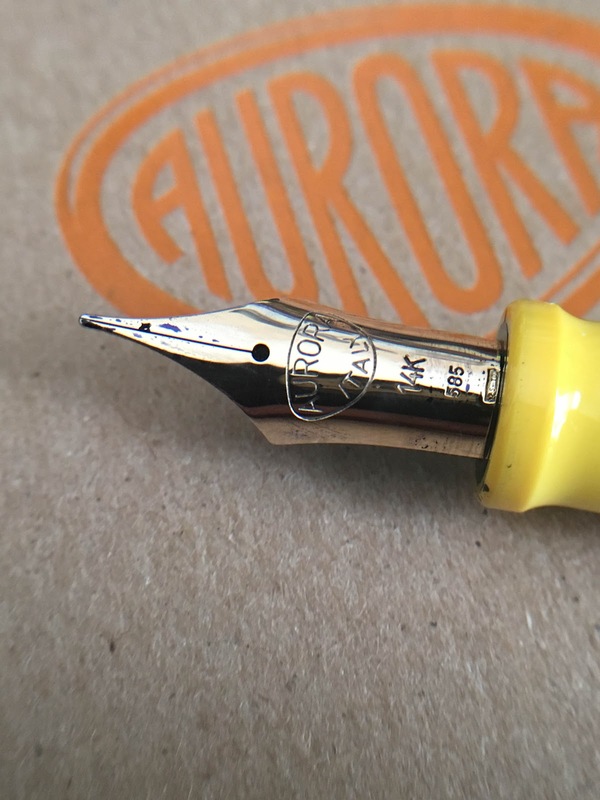 I think this nib is actually pretty great. It's not vintage flex. It doesn't flex as soon as it hits the paper. If you want that, you're going to have to go vintage or you're going to have to go for a dip pen. This one is usable by anyone, it's tough enough to make it through the hands of a few hundred people at events before it came to me, and it is a pretty worry free experience. Use the right ink, and this pen and nib will really shine.